David has been in EMS for five years and part of the MedStar team since 2015. As a child, David spent a lot of time in hospitals and knew from an early age that healthcare was the career for him. 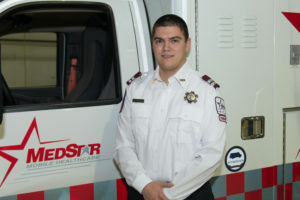 While living in Alaska, David enrolled in a paramedic program that had a clinical affiliation with MedStar and did his school internship in Fort Worth. David decided MedStar was where he wanted to be. Once David was accepted for the paramedic position, he moved to Texas, and the rest is history. David’s favorite aspect of EMS is helping people. It is because of David’s willingness to serve others that he was chosen by his peers as a Star of Life nominee.